California 1, while massive and spanning the entire California coast, has a spectacular stretch in Mill Valley that is unique to Marin County. The road starts in this quaint little country town and winds its way up through the redwood trees before crossing over to the coast side and Stinson Beach. The views are phenomenal the whole way up, as they change from valley views to hillside redwoods to a stunning coastline. 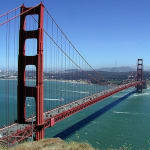 Of course, everyone knows how beautiful it is, and it is just about the only way to get to Mount Tamalpais or Stinson Beach, two very popular North Bay sites that are just over the Golden Gate Bridge, so traffic can get a bit congested, especially on weekends. This is a two-lane road, so all you need is one car to be tentative, and the entire traffic line is slowed. And, like many Bay Area roads like this, cell phone reception can drop faster than a surfer dropping into a wave on the nearby coast. Don't plan any conference calls on this drive. Yet despite the crowds and winding roads, this is another reminder of why I love Northern California so much. "Avoid on a Nice Day..."
The Mill Valley section of Shoreline Highway offers some of the most stunning views found anywhere in California - but at a price. On a nice day, anyone from the four corners of the Bay Area can be found gravitating to the surfing, rock climbing, hiking, and family fun to be found in Stinson Beach, just north of Mill Valley. You can't blame them - the activities offered are spectacular - but it does affect the timing and the driving experience. On the plus side, Shoreline Highway offers some of the best panoramas of cliffs, beaches, clean breaks, rocks, and sunsets to be found anywhere in Northern California. The driving is surprisingly smooth - while it winds, it does not twist and turn *quite* as much of some similar roads in the area. Watch out for Mill Valley bikers, who tend to take over this road on weekends (not that you can blame them).